During renovations of THE ANGEL pub in 2003 a letter was found underneath the plastering from a builder living at 89 Chalcombe Road South Norwood. The letter was placed there in 1955 during earlier building work and is now on display upstairs in the Thameside pub. Here it is and we wondred if anyone might know the plasterer’s family or the Beckenham company he worked for? 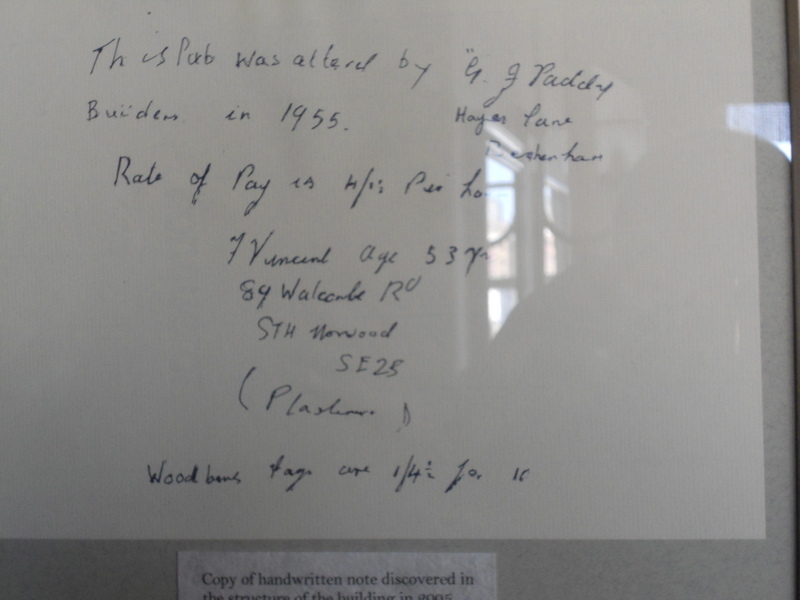 I think the rate of pay was 4s per hour 1955 is pre decimal currency. so he was paid 40 pence an hour. The Woodbines were 1 shilling and fourpence halfpenny or about 6 or 7 pence. No one would have earned £4 in the building trade in 1955!